For many years, computer controlled automated testing has been the domain of experts in programming languages developing proprietary software. 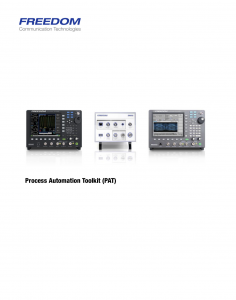 FREEDOM Communication Technologies has developed the Process Automation Tool Kit (PAT) to enable a professional with no background in computer programming or automation to generate scripts for testing a variety of devices. With PAT, for instance, users can develop an automated LMR Radio test for manufacturing or service centers. PAT provides a simple interface where the technician does not need to learn the test instrument’s remote command structure. He can simply select from a library of commands labelled with the function rather than the command.